Let’s take a trip back in time, back to the distant year of 2010. Cut the Rope made it’s debut on iOS, introducing the physics based game that would eventually be found on the home screen of millions of phones and be responsible for a shocking amount of hours wasted. 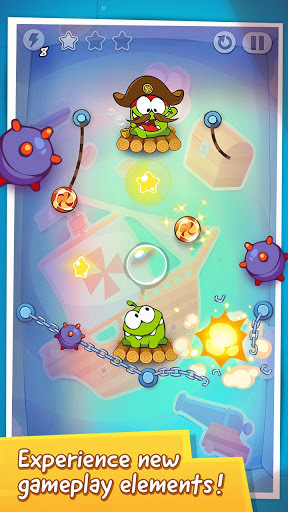 Cut the Rope gave players plenty of levels, cleverly designed challenges, and stars to collect. Now it has added a new element, which is introduced thanks to the new premise of a time-traveling Om Nom: A second hungry monster looking to gobble up candy. It doesn’t shift the gameplay too much, but it does send you back to a game that hasn’t gotten a new installment in two years and makes us remember exactly how much fun it was back when it first came out. If you’ve played Cut the Rope before – and let’s be honest, you probably have – then there isn’t a whole lot to explain about how Cut the Rope: Time Travel works. The new subtitle doesn’t change the core gameplay. It’s your job to get pieces of candy into the mouths of your hungry monsters by navigating the obstacles and objects that exist within the physics-based level structure. The biggest change is requiring you to do this task twice now that Om Nom is being joined by his ancient ancestors who have collected candy hung from rope for generations. Aside from the addition of a partner that needs feeding on each level, there are some additional elements to the level designs that players can interact with as they move the candy from it’s starting location and into the mouth of the green gobblers. Chains can lock up candy and require a blade to chop in to; a freeze button can stop the movement on screen and completely halt the momentum of an otherwise off track piece; bombs send anything in its radius flying; and bubbles will gently float candy upward. These elements are introduced gradually and integrated into bigger challenges as the game goes along. They are never too brain melting, but will definitely leave you scratching your head from time to time as you try to decipher how it all works together. Level design is as sharp as ever, requiring players to make smart decisions to get the candy to their monsters and even smarter ones to collect all three stars along the way. The big appeal of Cut the Rope: Time Travel, apart from giving players a new batch of levels of one of the most beloved mobile game franchises around, is the level designs based on different eras of history. 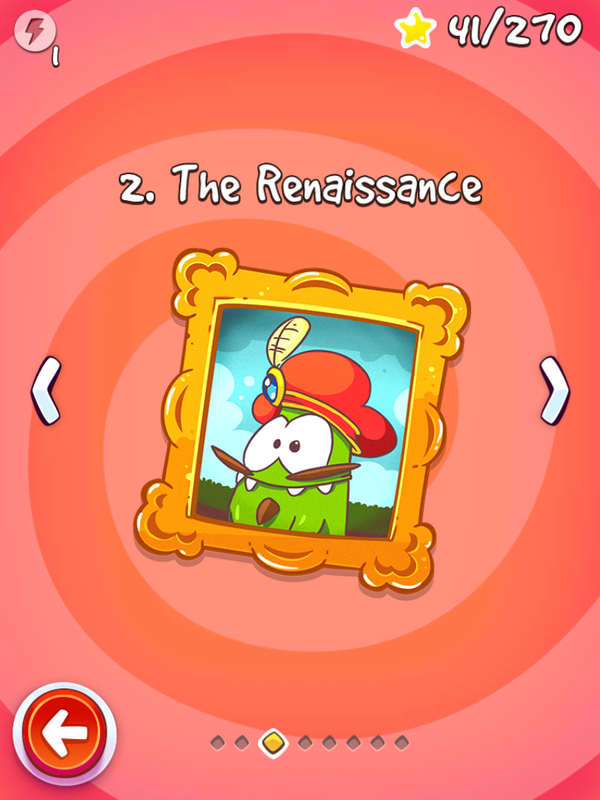 The game takes you to the prehistoric era first, where you’ll see the Cro-Magnon version of Om Nom with a bone atop his head. You’ll also move around time to visit the Renaissance, ancient Egypt, visit a maritime pirate ship, and check out the lifestyle of the Greeks. The gameplay changes minimally throughout this, as new elements are introduced, but sadly they don’t related directly to the era you’ve traveled to. It would have been nice to see a little more done to make the gameplay a little more representative of the time-specific level themes, but hey, it’s still a heck of a lot of fun. Cut the Rope was a huge success for a reason: The game is simple enough to pick up and play at any time but demands enough of a players attention to ever keep it from feeling like a mindless romp. There isn’t a level in Cut the Rope: Time Travel that doesn’t require players to make a decision, learn a new function, or manipulate the environment to create the desired result. It’s a game that requires some sort of focus and understanding while you play, but still maintains its game-y appeal by never asking too much of it’s players. Even when it does hit that rare point of feeling too challenging, it lets players “cheat” their way through it with a limited use superpower option. Cut the Rope: Time Travel is a game that never lulls you with repetition and never makes you want to take a hammer to your mobile device out of frustration. It’s a cute, fun, occasionally difficult game that will have you saying “just one more” after every level. If you’ve played the Cut the Rope franchise before, you’ll love this one as much as the last. If you haven’t, this is just as good a place to start as any. You can download Cut the Rope: Time Travel for the iPad, iPhone, Android, Kindle Fires, and Nook tablets. Download links are on the Zeptolab website.